We’ve been working up to watching Your Name by watching all of Makoto Shinkai’s other movies first, and we’ve finally watched all of them! We actually ordered a 4K Blu-Ray of the movie from Amazon Japan since it won’t release here for a while and we’re not sure if it will be in 4K even when it does (side note: ordering from Amazon Japan is amazing, it got here in two days even though we selected regular non-expedited shipping). Mitsuha, a high school girl living in rural Japan, and Taki, a high school boy living in Tokyo, have been having strange dreams of a life that’s not their own. Eventually they realize they are swapping bodies with each other at random and strike up a friendship by leaving messages on each others’ phones. I thought the entirety of the movie was going to be about the body swap (although I couldn’t imagine Shinkai just doing a plain high school hijinks movie), but there is a lot more to it. 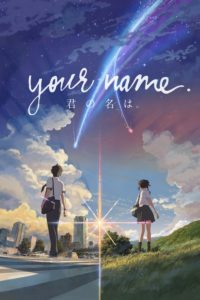 Your Name is unquestionably a Shinkai film, there were things in it that reminded me of elements from every one of his previous movies. Unlike his previous work though, this one is very well-balanced. All of his movies have been good but I would describe them as melancholy or bittersweet whereas Your Name has a bit of everything – comedy, tragedy, drama, emotional moments – and does it all well. It’s currently the highest-grossing anime film of all time and I can definitely see why. Amélie is a quirky French romantic comedy about a woman that decides to make the lives of those around her better but struggles to connect with people herself. It was one of the first movies I watched when I moved to the U.S. (I was used to Indian movies and remember being shocked that a movie could talk about orgasms so blatantly). I hadn’t seen it since then and I have been looking forward to seeing what I’d make of it when not so wide-eyed. It was just as good as I remembered it being, although I had a different perspective on most things. Pretty much everything about this movie is excellent, I can’t focus on any one aspect above the others, I loved it. Watch it! Makoto Konno is a teenager who inadvertently gains the power to go back in time. At first she uses her powers for frivolous things that improve her life – doing well at tests, avoiding embarrassing accidents and so on, but she soon realizes that her time leaps are affecting people around her as well, often in bad ways. I thought this movie was great, Makoto is a fantastic protagonist, she’s energetic, curious, tends to leap (often literally) before she looks. She was a lot more identifiable to me than most other Japanese characters; I especially liked that her two best friends were boys and it wasn’t portrayed as weird. I’ve always had a slight bias towards stories about the ramifications of time travel and this movie handles that very well. It ended up having more romance that I would have liked towards the end but I loved it anyway. I’ve been wanting to watch The Sea of Trees ever since I learned about Aokigahara and it’s reputation as a “suicide forest” in an anthology I read earlier this year. Matthew McConaughey plays Arthur Brennan, a suicidal American professor who travels to Aokigahara to end his life. He meets a Japanese man who has been lost in the forest for a couple of days and helps him search for a way out. I have mixed feelings about this movie, there’s a lot of good things about it – Matthew McConaughey’s acting, the beautiful cinematography, the stark and eerie atmosphere, but I felt let down by the end. I think the flashbacks to Arthur Brennan’s life before his trip to the forest were supposed to make me feel more sympathetic towards him but they bored me and took me away from the parts of the movie that I was enjoying. Alex “Hitch” Hitchens (Will Smith) is a consultant that helps men get noticed by the women they like. Despite dealing with love all day long, he’s happily single and intends to remain that way. Sara Melas (Eva Mendez) is a gossip columnist who is cynical about relationships, right up until she meets Hitch anyway. A standard romantic comedy ensues. I wouldn’t have wanted to see this movie if Will Smith wasn’t playing the protagonist, he’s charismatic and lovable in most things that he is in. The movie itself wasn’t that great and the characters seemed to be doing whatever the plot needed them to rather than being consistent, but I remained entertained. Four Lions is a satirical comedy about four British Muslims who decide to become jihadists and commit an act of terror. I think this is actually a well-made and well-acted movie (it stars Riz Ahmed, who is terrific in everything that he is in) with great details (I especially liked how the South Asian characters kept switching to Hindi/Urdu), but I just wasn’t interested in what it wanted to say. It portrays the protagonists as incompetent and for the first two-thirds of the movie, we follow their escapades as they make blunder after blunder. I don’t usually enjoy movies whose sense of humor involves the audience laughing at how dumb people are (even if it’s about an edgy subject like terrorism) and I found it boring. The last third of the movie gets a bit exciting and has some heart, and I wished the entire movie had been that way. I’ve never read any of the Judge Dredd comics, but I’m a big fan of the recent Dredd movie starring Karl Urban. I’d heard that the original movie starring Sylvester Stallone was pretty bad but I wanted to see it for myself. And yeah… it’s terrible. It’s a paint-by-numbers late 80’s/early 90’s sci-fi action movie, a bit like Robocop/Total Recall/Demolition Man, except that those movies are actually great. Dredd is a generic action hero without much personality. He’s got the pithy one-liners that people love to put in a certain kind of action movie and he occasionally says “I am the law!” and that’s about it. Even the actors seem to know they’re in a bad movie and don’t push themselves too much.